Before attending the Book Expo in Los Angeles the weekend before last, where among other things, I had a great podcast chat with Amazon’s Tom Nissley and a fabulous Knopf dinner at Suzanne Goin’s Lucques, I had written a piece for Publishers Weekly on “traffic” both inside and out of the Convention Center. 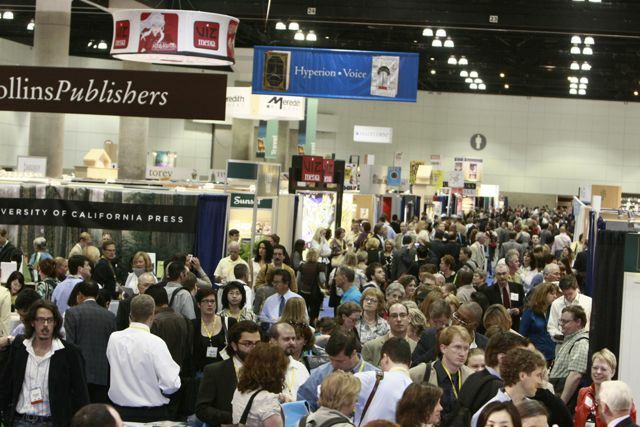 It was mostly speculative, in the sense I actually hadn’t been to BookExpo in a while. But the experience of actually navigating the convention brought up a few more things vis a vis what we normally think of when we think of traffic; namely, the flow of people through cities. Firstly, BookExpo is arranged, like the cores of most cities, as a grid (there are even “numbered” streets, though the overhead signs aren’t visible in the photo here). There were wider “avenues” of sorts that tended to have the highest traffic volumes, including those people who seemed to have a destination in mind, as opposed to the casual browsers. Then there were the smaller, more narrow “side streets,” in which people would turn off, and move more slowly down, with less of a sense of immediate purpose, perhaps “parking” at a booth. One sure way to attract traffic to your booth, by the way? Install an espresso machine. As with Manhattan, the most valuable real estate seemed to be at the center of the “city,” with booths at the periphery attracting fewer visitors (though I couldn’t guess what the rate of “decay” was). Another area of the trade show, let’s call it “Brooklyn,” housed some of the smaller and more offbeat publishers (and getting there required a walk that seemed as long as that to cross the Brooklyn Bridge). I sometimes saw another Manhattan phenomenon: “Blocking the box.” As an author like Barbara Walters prepared to do a signing, a line would grow down one of the “avenues,” and the people queued would in fact stretch in front of the intersections to side streets, thus creating mini-traffic jams. The line for the big authors also produced “rubbernecking” effects, of course, as people slowed to see who was signing. Of course, having a grid of small “blocks” helped defray traffic problems, as people facing congestion could always find another route without being stuck for too long on route (particularly behind someone weighed down with Penguin Classics totebags laden with free galleys). This was one of the problems I found in navigating the city of Beijing. Many of the blocks were epic “superblocks,” with not even alley-ways permitting cross-circulation; I timed the walk around one block (and I walk relatively fast) to be almost an hour. The fact that small blocks are good for retail purposes has been argued by Bill Hillier, the urban movement specialist based in London. He talks of a “grid intensification effect” and how retail efforts are often begun in locations where blocks are small, as this promises more “integration” into the local neighborhood (e.g., the “corners” in The Wire). There was, of course, talk that traffic was down at this year’s show, owing to the economy and the distance of Los Angeles to the nerve center of publishing in New York. But next year’s show is in NYC, and so people will be able to walk through the grid of Manhattan before entering the grid of BookExpo. Tips on navigating L.A., inside the convention center and out. The most famous joke about Los Angeles is Woody Allen’s retort in Annie Hall: “I don’t want to live in a city where the only cultural advantage is that you can make a right turn on a red light.” Of course, that’s not the only cultural advantage: What about validated parking? The clever drive-through system at In-and-Out Burger? Or L.A.’s “permissive” left turns; i.e., no waiting for the green arrow, a bonus considering the city’s 40,000-odd intersections? Los Angeles lives and (literally) breathes traffic. No U.S. city has as much congestion or as many traffic reporters. To drive there is to be immersed in a soundtrack of strange “SigAlerts” and “traffic breaks,” as everything from Porta Potties to avocados is dumped on the freeway (ladders are reputedly the most dropped item). One traffic reporter could tell the direction of the rain based on the traffic patterns on his computer screen. As you find yourself in L.A. during Book Expo, you can’t help thinking of traffic—as you go to the L.A. Convention Center, and once you’re there. Traffic in L.A. is hardly news. A short drive from the Center, you’ll find the intersection of Wilshire and Western, in the 1920s the world’s most crowded intersection. L.A. has always been at the forefront of fighting traffic, from automated traffic signals in 1922 to “reversible lanes,” which capitalize on the “directional peaks” of the morning and evening rush hours. Now, most roads are busy both ways during peaks, so reversible lanes are history. One anecdote exemplifies traffic’s ingrained place in the city’s psyche. When Bette Davis was asked what advice to give an aspiring starlet as the “best way to get into Hollywood,” Davis immediately quipped: “Take Fountain” (after the lesser-known Fountain Avenue). The Hollywood-traffic connection remains today. Just a few blocks away from Book Expo, underneath City Hall, sits L.A.’s traffic bunker. This is where The Italian Job thieves rigged the traffic signals to stage their heist. It’s also where, every Oscar night, traffic engineers run special “packages” to help the stars’ limos get to the awards on time (sorry, there’s no BEA package, even for Stephen King). Traffic will be as obsessed over inside the Convention Center as out—but inside it’s not a dirty word. Exhibitors want traffic. They want to be in the high-volume areas: at the entrance, near the good snacks. Like Starbucks, which colonizes street intersections, corner booths are coveted for their access to two traffic streams. And as rival coffee shops like being near Starbucks to capture their overflow, so do exhibitors like being near the “big” booths. Some exhibitors are rumored to use extra-thick carpeting as a “speed trap” to slow people as they pass. What about navigating all that traffic for the 25,000-plus attendees? Just as on the streets of L.A., there are some ways to make life easier. “Rush hour” is generally the first two hours of the day, so to avoid traffic, “reverse commute” and don’t show up until noon, when many are heading to lunch. If you need to merge into a tight stream of traffic, try eye contact. People are more willing to do things—like let you in—when you look them in the eye (science backs this up). Take the stairs instead of escalators (most people won’t take the stairs until escalator waits reach one minute). You might also use Book Expo to observe some findings about pedestrian traffic. People tend to segregate themselves naturally into “directional streams” (no white lines required!). Pedestrian flows tend to take a “checkerboard” pattern, as we seem uncomfortable walking next to a stranger for too long. Studies show people on cellphones walk more slowly and are less likely to look both ways before crossing streets (or trade show aisles). Watch for traffic phenomena like “emergent behavior,” demonstrated when a seemingly scattered crowd suddenly forms an instantaneous beeline (because someone’s offering some swag at booth 1130). Finally, if you’re getting a book signed and the line is long, remember the rubber-necking principle. Everyone slows to look at accidents because it’s only a few seconds delay, and they’ve already waited a long time. But if everyone agreed not to take those few seconds, there wouldn’t be those larger delays down the line. Keep those dedications short, folks! Knopf will publish Tom Vanderbilt’s Traffic: Why We Drive the Way We Do (and What It Says About Us) in July. This entry was posted on Monday, June 9th, 2008 at 1:58 pm	and is filed under Book News, Cities, Congestion, Etc., Pedestrians, Traffic Psychology. You can follow any responses to this entry through the RSS 2.0 feed. Both comments and pings are currently closed.